6.1 Are Inflatable Hot Tubs Any Good? There are several excellent hot tubs that can be purchased for under $500. After an extensive look at the market for inexpensive inflatable spas, we have determined that the best cheap hot tubs under $500 are the Intex PureSpa 77″ Inflatable Hot Tub line. These spas hit the right price point given their feature list, and work very well. The Intex PureSpa 77″ tub can fit up to 4 people (really 2 comfortably, and 4 if everyone squeezes in), and will heat the water up to 104′ for comfort. The included pump will get the bubble jets moving, send relaxing bubbles around the tub, enhancing the experience. An additional plus to this hot tub is the 1-year warranty offered by Intex. We really like this tub, and it is a runner-up for our Best Inflatable Hot Tub list as well! For more information on this inflatable spa, check out our product reviews below. The SaluSpa Paris is also a great budget hot tub under $500, with the unusual selling point of an included LED lighting system. The SaluSpa Paris is approximately the same size as the Intex PureSpa and is best seen as a two-person portable hot tub, though it can squeeze in four. It is a bit more expensive than the PureSpa, but the added light capability really is a nice extra feature. If you’re looking for ambiance as well as bubbly relaxation, the SaluSpa Paris may be a better choice. An additional plus is a warranty: SaluSpa provides a 360-day warranty on this tub so buyers can be comfortable in their purchase. For more information on this tub, please check out our Product Reviews section below. The Intex PureSpa 85″ is a larger capacity tub, capable of handling up to 6 people (4 comfortably). If you’re looking to use the tub with several people regularly, this is an excellent choice for a tub. The PureSpa 85″ is nice looking, and has all the functionality you need for up to 6 people to relax in style. If you aren’t looking for a high capacity tub, we would lean toward the (cheaper) PureSpa 77, but if you think you will regularly use the tub with several people, or if you have a large patio area that is crying out for a good sized hot tub, this is an excellent choice! Like the PureSpa 77, this hot tub is covered under a 1-year warranty for peace of mind. For more information on this low cost hot tub, please check out our product review section below. Here we review several budget hot tubs under $500, compare the plusses and minuses of each, and pick our favorites. We’ll start with a comparison table to get the lay of the land, and then move into individual reviews. We’ll conclude with a further look at our favorites. Intex 77in PureSpa, the Best Cheap Hot Tubs Under $500! The Intex PureSpa 77″ is an inexpensive, circular portable home spa that comes in a basic tan color. The spa is offered in two different configurations: a standard blower jet system and a deluxe massager blower jet model that goes well over the $500 threshold. For that reason, we will stick with looking at the standard system. It is the best budget hot tub on the market! Though we don’t love the color, this spa is one of our favorite portable hot tubs! In fact, it was a runner-up for our general Best Inflatable Hot Tub. The Intex PureSpa is a nice spa package at a cheap price point. The whole system is of good quality given its cost, and the general feel of being in this spa is one of luxury. On the standard Massage Spa Set, you’ll experience a delightful water temperature and water movement, and bubbles that move throughout the spa, coming from the bottom. The base area of this hot tub is cushioned and does not inflate like the sides do. The base is insulated for comfort and protection, and the bottom area functions as the seat in this tub. There is no need for additional seating to be used, as the wall and water height is configured based on the users sitting on the floor of the tub (for most users in a normal height range). Assuming the users of the tub are not frail or pregnant, the Intex PureSpa is pretty easy to get in and out of. The walls of this spa are made of what Intex calls FiberTech construction. The high tech, light-weight material gives the walls their structure. The FiberTech material allows users to sit on directly on the top of the wall of the tub while it is inflated, without causing the walls to buckle. Bottom line: because the walls are sturdy, it’s generally pretty easy to get in and out of this hot tub. One nice bonus feature this hot tub features is a built-in hard water softener. The water softener helps make the water feel better and more soothing on your skin. It’s a cool feature that most of the competition lacks. The control panel on the Intex Portable Spa is pretty easy to use, and functional. It is the control center of all of the needed options for the Intex spa system. You inflate, heat, and move the water around using the control center. Should you desire a cool soak with bubbles, you have the choice of running the jets without heating the water. Intex has supplied a handy setup video that shows how this hot tub is assembled and heated up for proper use. Take a look! The Intex Tub package includes the hot tub itself, a helpful floating pool chemical dispenser, an insulating thermal ground cloth, an insulated cover, an inflation hose, and a handy carrying bag for portability. In our eyes, the cover is a big extra. It works well to keep things insulated, and features a lock for safety. This is a big plus if you’ve got kids around! The included power cord is about 12′ long, and Intex suggests you don’t use any additional extension cords to lengthen the run. For spa chemicals for the Intex PureSpa, we suggest the Spa 56 chlorinating granules. See our information on pure spa chemicals for more. The Intex PureSpa is an impressive inflatable hot tub system, with some nice options, at a cheap price point. The unit is attractive and unobtrusive (though we wish they would change the color! ), as well as sturdy and highly functional. It is rated to fit four people, though we think that is tight. Two can fit comfortably, and four is a bit tight, though doable in a pinch. Intex offers a one year warranty on the PureSpa, which helps supply some peace of mind that these units will stand the test of time. When the weather gets below 40′, we suggest you bring this spa in, or otherwise protect it, as cold weather will definitely damage the control center. This spa is an excellent choice and is the best portable hot tubs under $500 on the market today. As an additional bonus, this cheap hot tub is for sale through Amazon Prime, though they may take up to 5 days to be delivered, as they will be shipped via ground shipping. The SaluSpa Paris is a fun, cheap inflatable hot tub with a cool distinctive feature: an LED light show capability. The tub is a 4-6 person capacity (four pretty comfortably, and six if you really squeeze in), and is pretty attractive looking. At night, it shines with a 6-phase changing LED color system, a very cool little extra that really amps up the ambiance and mood of this inflatable spa. This is a very cool hot tub! It looks nice, and the addition of the LED lights really brings the SaluSpa Paris to another level compared to some of the other tubs on this list. The price is pretty aggressive, and overall this is a great package. It is our runner-up choice for best cheap hot tub under $500. The walls and frame of this tub are constructed of what SaluSpa calls leatheroid material. Leatheroid is puncture-resistant and strong enough to hold the weight of a person while sitting on the edge of the inflated tub. Consequently, getting in and out of this tub is not difficult, and there are no step stools needed. The Lay Z Spa Paris includes a cushioned air pad floor material, which helps insulate the tub and separates the tub from the ground. There is no need for additional seating with this tub unless you really want it. It is designed such that you sit directly on the ground, and is quite comfortable and relaxing as is. The water is targeted to be chest-height for comfort. The hot tub also includes a leatheroid cover with double safety lock clips. The cover helps protect the tub from the elements and also helps keep the water inside toasty warm. The brains of this package are the control panel, which performs all the heating and air bubble activity, as well as inflation and deflation of the tub. Everything is contained in the control panel with the exception of the LED lighting control, which can be adjusted using a handy remote! Here is a quick video showing the setup of the Lay Z Spa Paris Hot Tub. The LayZSpa Paris comes with the cover, the insulating base mat, an instructional DVD, a filter cartridge, and a chemical floater. There are no accessories needed with this tub. It comes with most everything you need, and it is designed so that when you sit on the base of the tub, the water comes to shoulder height for an average-height person, so there is no need of additional chairs or pads. The LayZSpa Paris uses the Bestway filter cartridge system. For bromine, the Leisure Time Brominating Tablets are good to use with this hot tub. Additionally, the LeisureTime Bright and Clear Water Treatment chemicals are suggested. The SaluSpa Paris inflatable hot tubs are our runner-up choice for low-cost hot tubs. The Paris is large enough to fit four people comfortably, and six if necessary, and the LED lights give the tub a unique flair that really makes it a magical experience. For buyer reassurance, SaluSpa offers a warranty of 360 days on the heater pump, 180 days on a body (the inflatable part), and 30 days for hoses, fittings, etc. This should help buyers feel comfortable that their investment won’t go to waste in a short time. 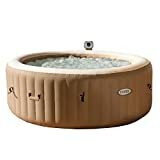 As an additional bonus, this hot tub is available on Amazon Prime, however, this is a heavy item and will be shipped ground, so delivery is closer to 5 days. The Coleman Lay Z Spa Inflatable Hot Tub is a decent quality, inexpensive inflatable spa. It is not the most attractive of the spas on our list, but it is capable of fitting six people (tightly). The simple design and co-branding between Coleman and Lay Z Spa make it a good choice among inflatable hot tubs, especially at the price point it hits. 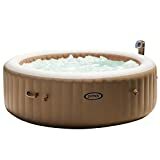 The Coleman Lay Z Spa is a nice spa at an attractive price. The walls are impressively solid and are comfortable to rest your back on. This hot tub is made of a sturdy inflatable material known as “leatheroid”. It is a puncture-resistant polyester mesh core encased in two layers of PVC. The walls of this spa are made of what Coleman calls I-beam material (not steel! ), and are strong enough for users to sit on the top of while the tub is inflated without causing the tub to collapse. Like most of the inflatable spas on the market, there are no seats in this hot tub. You just simply sit on the floor of the tub, which is an inflatable cushion. The floor is quite comfortable and has a separate air pad cushion beneath that helps with insulation. This set up will keep you submerged in toasty warm water approximately up to your shoulders (depending on your height!). However, if there are 6 people in the tub, you won’t have much room for your legs, unless you really scrunch them up. For that reason, we see this more as a 4 person tub than a 6 person, though it is advertised as a 6 person. In a pinch, 6 people can fit, but 4 is much more comfortable. The Coleman Lay Z Spa has an attached control panel mechanism that controls all of the functions of the spa. The pump and heater are housed in the mechanical system, separate from the inflatable portion of the tub. On the top of the mechanical housing, there is a digital control panel used to engage the jets, the heating system, and to control all other functions. The motor powering the pump that inflates the spa is the same motor that supplies the bubbles and moves the water around when engaged, and it’s all very easily controlled. Here is a video from Coleman showing how the Lay Z Spa is set up and taken down. You can see that it is quite simple! The Coleman inflatable hot tub package includes an insulating base pad that goes below the tub in order to separate the tub from the ground. Additionally, a top cover is included as well. The cover will keep the heat in the water when the weather gets chilly, but if it gets down below 40 outside, the cover starts to struggle to keep up with the temperature loss. The power cord included with this package is about 8′ long and includes a GFI for additional safety. It plugs into a standard outlet, and it is not recommended that the plug is used with an extension cord, though a high amperage outdoor extension cord may work. Accessories like seats are available for this affordable hot tub, but with special circumstances excepted, you don’t really need them. The inflatable base provides a comfortable seating area, and when sitting on the floor the water is at the proper height for comfort. For most users, there is no need for a step stool to enter this spa, as the height of the walls is low enough that climbing in and out is relatively easy. For those who are pregnant or ailing, you may want some sort of brace to help you get in and out, but the tub is pretty sturdy overall. The walls are rigid, so you can use them for extra support when entering and exiting. The Leisure Time Brominating Tablets are good to use with this hot tub. Additionally, the LeisureTime Bright and Clear Water Treatment chemicals are suggested. The Coleman Lay Z Spa is a good cheap hot tub that sits well under $500. The Coleman brand name has long been an outstanding brand for camping equipment, grills, and other outdoor items, but it is a bit unusual for the Coleman name to be emblazoned on a hot tub. The Coleman brand, when combined with the odd green color scheme makes the aesthetics of this tub unfortunate. We wish they had focused the branding a little more on the Lay Z Spa part, and less on Coleman part. At least they could have made the Coleman logo smaller! For buyer reassurance, Coleman offers a warranty of 360 days on the heater pump, 180 days on the body (the inflatable part), and 30 days for hoses, fittings, etc. You may find that your electricity bill goes up, perhaps $40-100/month depending on what your electricity rates are, how much you use the tub, and what the weather is like outside. 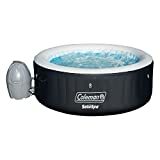 Overall the Coleman Lay Z Spa is a good choice for a cheap portable hot tub and will serve your needs for years to come, assuming you take proper care of it (note: it may take up to 5 days to deliver because it will be shipped via ground shipping). The Intex PureSpa Plus is an attractive, compelling offering by Intex. It features a similar tan color scheme to the PureSpa 77, and a quality builds at an aggressive price. It is essentially a larger version of the Intex 77″ PureSpa, for those who need the extra capacity. Like the Intex PureSpa 77″ mentioned above, this is a good product with an expanded size and capacity. If you are looking for a 6 person tub, or a reasonably roomy 4 person tub, this spa is a great choice. The bubbles produced by this hot tub are nice and provide comfort, but they aren’t really jets in the way that some hot tubs are. A ring around the tub expels bubbles into the water, and it all feels nice. The PureSpa 85″ features a handy cover that helps insulate the tub and protect it from critters and pollen/algae. The cover has an inflatable area in the middle that helps keep the water warm. The power cord that is included is about 10′ long and plugs into a regular 110v outlet. Intex recommends that you do not plug it into an extension cord, as the power load on the plug is significant. The setup is the same as the 77″ above, as they use the same mechanisms. The PureSpa 85″ includes the spa, the insulated cover, heating/filtration/bubble mechanism, hard water control system, two filter cartridges, an insulating ground pad, an inflation hose, a carry bag, a floating chemical dispenser, and 3-way test strips. That’s pretty much all you need to keep the spa going for a while, except for chemicals! There is no need for any other accessories on this tub, though if you want to get a headrest, drink holder, etc., you can do so. For the most part, they are not needed and are designed to be used as is. For spa chemicals for the Intex PureSpa, we suggest the Spa 56 chlorinating granules. This tub just squeaks in under our $500 threshold, and if you’re looking for a large capacity inflatable hot tub, the PureSpa 85″ is a great choice. If you don’t need the extra space, then we would lean toward the PureSpa 77″, just because it is easier to move around, heats up quicker, is priced more competitively, etc. The PureSpa 85″ features the same nice 1-year warranty Intex offers on the PureSpa 77″. As with all the tubs on our list, when the weather gets cold, this tub should be broken down and taken inside (see our article on inflatable hot tub winter use to potentially sneak around this). The control panel mechanism is not designed to run at temperatures under 40′. If you want to build an insulated housing around the tub, that may extend the season, but it is not recommended by Intex. Overall this is a great cheap portable spa, and as a bonus, it is available on Amazon Prime! Shipping is via ground, so it may take up to 5 days for the tub to arrive. This is one of the best affordable hot tubs around! All of the hot tubs on our list today are a great choice at a great price point. In the end, our favorite is the Intex 77″ hot tub, which might be the cheapest of the bunch! But if you need a larger size or a different design, you won’t go wrong with any of the options on our list. Here we examine many of the concerns buyers have when looking at options for cheap hot tubs and spas. Yes! An inflatable hot tub can work just as well as a standard hard-framed spa, and provide the same relaxation, comfort, and enjoyment. Unless you do some serious work, you won’t get the same built-in look that you get with a hard-framed hot tub, but they’re also much cheaper and easier to deal with. Let’s look at some of the aspects of owning an inflatable spa. Affordability is a huge concern when investing in a spa, as so many are extremely expensive. Fortunately, with the advent of inflatable hot tubs, a new world of cheaper, but high value, options have been opened. There are several bargain hot tubs under $500 that work well and supply a good deal of comfort. While for comparison, built-in hot tubs can easily cost thousands, or even tens of thousands, of dollars, when full installation is included. When the price is a big factor, the focus must always be on value. Which hot tub supplies the best experience for the least cost? What has the best warranty, and the most hassle-free user experience? All of these play into value. There’s no need to spend more than what’s necessary to get the experience you seek. Inflatable spas offer essentially the same experience as built-in hot tubs for a fraction of the cost. Additionally, there is a major feature that inflatable hot tubs offer that traditional fixed spas do not: portability! One of the most important features of an inflatable hot tub, and one that built-in hot tubs can’t match, is portability. Inflatable hot tubs can be easily blown up, and collapsed again in a matter of minutes. This ease of setup and take down makes inflatable hot tubs very flexible. Inflatable spas can be moved to different areas when needed and can be packed away for storage when not in use. This frees up valuable space for other things, like perhaps a beautiful fire pit. Inflatable hot tubs are easy to move between houses when you move, and they can even be thrown in the car and taken on vacation! Many who rent their homes, or those who frequently change locations, may only be able to use an inflatable hot tub for a backyard spa. Fixed hot tubs are extremely difficult to move once installed, and most landlords will not allow them to be installed. Inexpensive inflatable spas can generally be used both outdoors or indoors, and offer possibilities to renters that are not otherwise available with fixed hot tubs. An inexpensive hot tub can provide wonderful new experiences for the whole family. Several of the models on our list can fit 4-6 people, so sharing the experience of relaxing in a delightfully toasty tub is quite possible. Most of the units on our list are rated to hold between 4-6 people. You should consider how many people you think will regularly be using the hot tub at the same time, and use that as a starting point in terms of capacity. A larger tub will require more electricity for heating more water, which may be a significant factor down the road. Smaller tubs are quicker to fill, quicker to heat up, and quicker to break down. If you think only one or two people will be using a tub, it may be cheaper to focus on getting something no larger than what you really need. Many who have muscle problems and joint issues find that lounging in a hot tub is extremely soothing and rejuvenating. People with back problems, shoulder problems, hip problems, those with pregnancy-related pains, and general joint aches often report that the hot water and movement of the flowing bubbles massages and soothes aching muscles. For centuries, trips to hot springs have been prescribed as a treatment for aches and pains all over the world. The idea is old: a soak in a warm, bubbly tub is just what is needed after a long day at work, a long day in the garden, or a long workout at the gym. Not long ago, the only cost-effective way to enjoy time in a hot tub was to become a member of a place that had one (costly fees!) or gets a fixed hot tub installed, which could cost well into the thousands. With the introduction of cheaper inflatable hot tubs to the market, these opportunities for relaxation and restoration are available to all. In this section, we examine the requirements for installation, setup, and use of an inflatable hot tub, and cover some tips to make things as painless as possible! Each of the spa models on our list will have a unique method of installation and assembly. Fortunately, many manufacturers have begun to supply youtube videos or other instructional material on how to set up and take down each individual hot tub. By watching these videos, it’s easy to get a good sense of the difficulty of setup and take down and get a sense of which hot tub is best for your needs. If you have questions about setup and takedown of one of these cheap portable hot tubs, it’s best to reach out to the manufacturer directly to start off with. You can also comment here and we will be happy to help you as best we can. One of the negatives of these cheap hot tubs is that they should not be used when the temperature gets below 40′ Fahrenheit or 4′ Celsius. Many people associate spas with winter weather (hopping in after going skiing is a magical experience!) but these new cheaper hot tubs don’t handle cold weather the way fixed hot tubs can. These spas are not suitable for use in environments below 40′ F/4′ C, because the pump mechanism could freeze, resulting in permanent damage to the mechanical system. That’s bad. When the weather gets down close to freezing, we suggest that you deflate the spa and store for later use, or move the tub inside where it will be toasty warm. If you really want to keep using the spa when the weather gets frigid, you could consider building an insulated frame around the mechanical unit, enabling it to stay warmer than the outside air. This is generally not suggested by the manufacturers, but… it works… and allows you to keep the water warm when it’s chilly out, while not damaging the pump and heater mechanism by keeping them in the cold air. Most of the units on this list are capable of keeping the water close to 104′, which is just about perfect, but again, they are not really designed to work that hard in very cold weather. All of the class of inexpensive hot tubs on our list use a standard plug to power the mechanical systems. Unlike fixed hot tubs, which often require a licensed electrician to wire everything, these personal hot tubs are simple and DIY. That said, many of these units can put a significant load on the electrical system due to the high powered heating element’s requirements. In general, you want to make sure that the hot tub is on its own circuit. Don’t go plugging in the lights and the sound system on the same circuit, in order to prevent breaker trips. You should also consider the fact that you’ll have a lot of moving water near your electrical outlet! If possible, you want a waterproof housing for your electrical plug, so that any errant splashes don’t cause problems. These new cheap hot tubs can weigh a lot! Even though they are inflatable, when they get filled with water and four to six people climb inside, the total weight load for all of this can exceed 1.5 tons, all in a small area! For that reason, we suggest that you confirm that the location you wish to install the spa will be capable of handling such weight. If you are planning on using your spa indoors, calculate the estimated total spa weight (we supply this information in our reviews below). Then take out a tape measure and measure the thickness of your floor joists. Subtract 1″ for flooring thickness, and 1″ for ceiling thickness (below, unless it’s an open ceiling) and you’ll have your joist thickness. For example, an 11.5″ distance between the basement ceiling and first-floor hardwood would mean the building is framed with 2×10 lumber. (11.5″ – 1″ for flooring and 1″ for ceiling = 9.5″, or the thickness of a 2×10). With that information, you can likely stop by your local building inspector and check if your existing floor will be capable of holding the spa. If the spa is going in a basement or on a concrete floor, this is much less of an issue. For outdoor use, generally, suggest you keep your spa off the deck unless it specifically engineered for a spa. It is much better to place the hot tub on a patio, in the garden, or in the backyard — someplace with solid ground. If you would like to set up the tub on a deck, we suggest checking with your local building official prior to setup. Set up your inflatable hot tub on flat, well-compacted ground. Ideally, a concrete patio or lawn will best support the tub. The ground should be capable of uniformly holding the weight of the tub and the people inside. The ground should be level-ish, at least. It doesn’t need to be perfectly level, but if it is way out of level, you may run into seepage problems and discomfort when using the tub. Most of the inflatable tubs on the market include an insulated liner that is placed below the tub, prior to inflation. This liner helps to insulate and protect the spa from the ground. Check our reviews section to see which portable spas include the insulating liner. All of the hot tubs on our list are self-contained units, and (with the exception of water treatment chemicals) don’t really need any accessories in order to function. That said, there are many accessories available if you want to tweak your setup. Available accessories include spa cleaning supplies, inflatable hot tub toys, cup holders, inflatable spa headrests, extra filter cartridges, pool sponges, and spa benches. If you are interested in perusing the accessories available to hot tubs, please click here. If you some part of your hot tub breaks, you’ll need spare parts. We suggest you contact the manufacturer directly. Each spa manufacturer generally keeps spare parts for each unit on hand. If you need something, they’ll ship it out and hopefully fix your problem. As we mentioned above, the suppliers of these cheap hot tubs generally publish installation and setup videos on youtube. When possible, we have linked to these videos so you can quickly see how easy it is to get these spas up and bubbling! Frequently emptying and refilling your hot tub can be a pain, so we definitely suggest getting used to properly treating the water in your spa to keep it clear and clean! Hot tubs will use different sets of spa chemicals, depending on the spa. For this reason, it is wise to read the manual prior to choosing a specific type of chemical for the tub. Many manufacturers will include a water treatment starter kit in the base package when purchasing an inflatable spa. When possible, we link to the appropriate hot tub chemicals in our reviews. When a portable spa is kept outside in the elements, the water in an inflatable should be changed approximately on a monthly basis. With proper treatment, you may be able to stretch the length out significantly further than that, though. If the water in the tub has begun to turn moldy or is saturated with algae, it should be changed. In general, cloudy water means that algae have flourished, and at that point, the water should be replaced. Combatting these blooms with chemicals can be difficult and costly, so often it’s easier to just start over. When a spa is placed inside, there is much less concern of outdoor pollution getting into the water. The chemicals can generally keep the water going for longer, though again we suggest changing the water out every few months to keep it fresh. Inflatable hot tubs are relatively cheap, compared to fixed, solid walled hot tubs. And part of that cost trade-off involves occasionally having to fix punctures and holes in the walls and lining of the tub. Punctures and holes can occur in an inflatable spa, even when users are careful. The bottom line is that they happen from time to time. When the hole forms, you must repair it with one of the (generally) included patch kit patches. The first step is to find the hole. If you can’t find it, try spraying dish soap on the deflated tub, and begin to inflate it. When you see bubbles form as water and air escape through the hole, you will find the location of the puncture. From there, clean the area and wipe it dry before applying the patch. Depending on the location of the hole, you may need to empty the tub in order to repair it. As we mentioned above, when it gets cold out, it’s time to deflate and store your hot tub. These tubs are not designed to be left outside when the weather gets below 40′ Fahrenheit or 4′ Celsius. Exposure to the elements can damage the pump and heater, rendering them useless. We recommend taking these tubs down when the nights get colder. If you really want to use the tub in frigid conditions, be sure to build an insulated housing around the control unit, or get the control unit inside and leave the hot tub outside. The tubs themselves aren’t bothered by the cold, it’s just that the control units don’t do well in freezing weather. Hot tubs can be expensive to install and maintain. Fixed hot tubs can cost many thousands of dollars to purchase and install; inflatable spas are a very budget-friendly option! Additional recurring costs are electricity to heat and move the water (varies between $15-100/month depending on your area, the temperature, and the amount you use the tub), and chemicals to keep the water clean ($10/month or so). Be sure to check out our Patio Furniture Deals to see if we’ve found any great Inflatable Hot Tub Deals around the web!